My husband John’s favorite saying is, “I didn’t lie. The truth changed.” He normally uses the phrase when he’s in a pickle and has some explaining to do. My initial reaction is to dismiss these words as a common excuse. However, upon further review, can a truth change? What is truth and how do you decide? Truth, commonly defined, means in accord with fact or reality; or fidelity to an original standard or ideal. The question of how words, symbols, ideas and beliefs may properly be considered true is dealt with by five major theories. Each theory presents perspectives that are widely shared by published scholars. Correspondence theory is the foremost philosophical theory on truth. Correspondence theories state that true beliefs and true statements correspond to the actual state of affairs. This type of theory posits a relationship between thoughts or statements on one hand, and things or objects on the other. It is a traditional model which goes back to the classical Greek philosophers such as Socrates, Plato, and Aristotle. Thomas Aquinas, a nineteenth century philosopher, stated the theory as: "A judgment is said to be true when it conforms to the external reality”. Correspondence theory is the most popular of the truth theories. According to a survey of professional philosophers and others on their philosophical views which was carried out in November 2009 (taken by 3226 respondents, including 1803 philosophy faculty members and/or PhDs and 829 philosophy graduate students) 44.9% of respondents accept or lean towards correspondence theories. The third philosophy on truth is Social Constructivism. Constructivism holds that truth is constructed by social processes, is historically and culturally specific. Constructionists believe that history and culture are man-made and therefore “truth is constructed”. I think most politicians are constructionists because they believe the truth can be manufactured! The Pragmatic Theory of Truth is the fourth major philosophy. Although there are wide differences in viewpoint among these and other proponents of pragmatic theory, they hold in common that truth is verified and confirmed by the results of putting one's concepts into practice. In short, if it works, it’s true! Lastly, Consensus Theory holds that truth is whatever is agreed upon, or in some versions, might come to be agreed upon, by some specified group. So, now you know! I learned early in my relationship with John what “the truth changed” really meant. Typically, the situation changed. Or, priorities changed. So when a friend, spouse, or boss “changes the truth”, understand they meant what they said at the time. Shake off the disappointment. Your kindness may make your relationship stronger! For more tips about handling “truth changes” visit www.AmericasMindsetMechanic.com. Growing up I dreaded art class. My hand wouldn’t do what I wanted it to do. Every project felt like a disaster. I remember one fourth-grade art project vividly. It was one with a happy ending. My class made paper mache’ pigs. On the first day, we applied paper mache’ over blown-up balloons and set them aside to dry. On the second day, we glued on the nose and feet, and painted our pigs. I got bored and didn’t apply enough layers of newspaper and liquid starch. Consequently, my balloon lost air overnight. And, my pig-to-be flattened into an oval blob. Everyone else had a perfect pig’s body. I was humiliated and on the verge of tears. Thankfully, a creative mom who was a helper that day rescued me from despair. “Oh! You decided to make a ladybug instead of a pig!” she said with a smile. Equipped with red and black paints and black felt, we created a beautiful ladybug. I would still have that ladybug, but my first husband got it in our divorce. Yep. It was that good! Also, I had some success in art class painting with watercolors. So, the “Watercolors in Nature” workshop at the Library last Saturday seemed like the perfect place to start anew in learning to express myself artfully. I brought with me a nine-year-old girl who already believed she could not draw or paint. I thought the day might bring breakthroughs for both of us. And it did. My young friend struggled at first. But then, she turned her paper over, shot me an “I’ve got this” smile, and sketched again. Her breakthrough moment of confidence was short-lived, though. As the paints were placed before us, her perfectionist anxiety resurfaced. “When are we going for chocolate ice cream?” she pleaded. On our way to the workshop, I promised her a fun day of sketching and painting followed by ice cream. So, unable to bypass her perfectionism and find the fun in brushing color on watery paper, we left at lunchtime. The watercolor workshop was only a partial success for her. As a recovering perfectionist, I can spot perfectionists everywhere. They are the ones miserable while everyone else is having fun. They are tense and impatient. They don’t try new things, because they might not do them perfectly. Their accomplishments are never enough. Consequently, celebrating success would be time wasted as more needs to be done. And, like alcoholics, they will deny they have a problem. I was lucky. A skilled friend intervened and showed me the ridiculousness of my ways. Now, when someone in the audience finds a typo in my presentation slides, I give them a prize for paying attention! (Caveat: surgeons, accountants, engineers, and musicians, perfection in your work is desired!) So, if making a simple mistake ruins your whole day, stop. You’re not fooling anyone. No one thinks you’re perfect. The next time your “pig” gets flat, make a ladybug and enjoy your day! The U.S. Naval Observatory (USNO), located in Washington DC, is responsible for determining precise time and managing time dissemination. Modern electronic navigating and communicating systems are increasingly dependent on precise time and time intervals. The Global Positioning System, for example, is based on the travel time of signals from the satellites in space: an accuracy of ten-nanoseconds (ten one-billionths of a second) corresponds to a position accuracy of ten feet! In fast communications, synchronizing time is equally important. 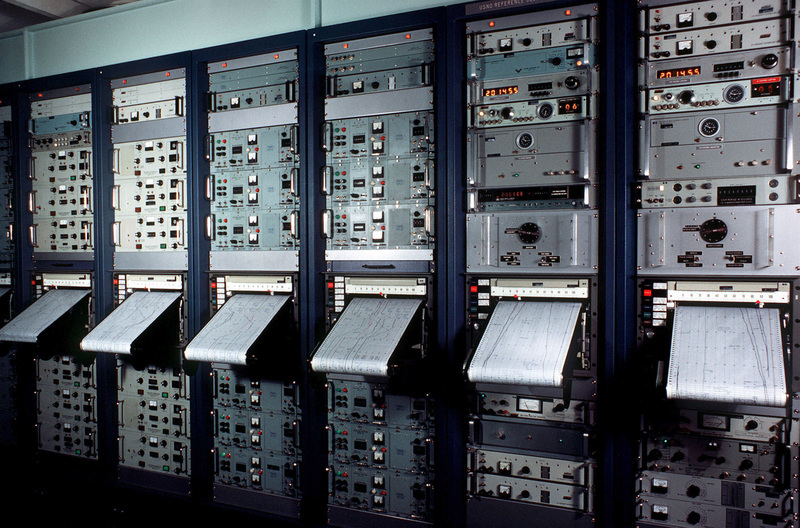 Most of these electronic systems are referenced to the USNO Master Clock. The Master Clock consists of two groups for a total of 44 clocks. The first group contains cesium clocks. They are less accurate than the hydrogen maser clocks of the second group, but more stable in the long term. In short, the radioactive decay of cesium is measured and averaged. To blow your mind, the real definition of a second is the duration of 9,192,631,770 periods of the radiation corresponding to the transition between the two hyperfine levels of the ground state of the cesium 133 atom. (Holy Cow!) There are currently of 31 cesium beam clocks operating as a part of the Master Clock. The average of these 31 cesium beam clocks is used to steer the average of the second group of clocks. The second group contains hydrogen maser clocks. Hydrogen masers are extremely accurate clocks, but only over short time periods (less than one week). Automatic comparison of all the clocks every 100 seconds makes the timekeeping accurate and extremely stable. The Master Clock does not change by more than about 100 picoseconds (0.0000000001 seconds) per day from one day to the next. Now the twist! Global Positioning System (GPS) time and Naval Observatory time do not agree! GPS time is ahead by 16 seconds. The Earth’s rotation is constantly undergoing a deceleration caused by the braking action of the tides. Through the use of ancient observations of eclipses, it is possible to determine the average deceleration of the Earth to be roughly 1.4 hundredths of a second per day per century. This deceleration causes the Earth's rotational time to slow with respect to the atomic clock time. So, after 500 days the difference between the Earth rotation time and the atomic time would be 1 second. To correct for this difference, a leap second is inserted to bring the two times closer together. Coordinated Universal Time is time corrected for leap seconds. My point is even though the Naval Observatory feeds the time signal into the GPS, GPS time is not corrected for leap seconds. The first leap second was introduced on June 30, 1972. A leap second was inserted into the timekeeping at the end of June. Did you notice? Now you know! I tell you that, to tell you this: It is your time. What will you do with your seconds today to ensure you are living your best life? Tell me about it at http://www.AmericasMindsetMechanic.com.